A child’s first set of 20 teeth, called primary or milk teeth, erupt from the gums between the ages of about six months and three years. These start to be replaced by 32 secondary teeth at about the age of 6, with most secondary teeth in place by the age of 21. All teeth have the same structure. Each tooth has a hard shell that surrounds a cavity filled with soft tissue, known as pulp. The exposed part of the tooth, or the crown, is covered by a layer of tough enamel, and underneath the enamel is a substance called dentin, which is similar to ivory. Long, pointed roots extend from the dentin and pulp into the jaw and are sealed by a layer of firm, fleshy tissue called the gums. 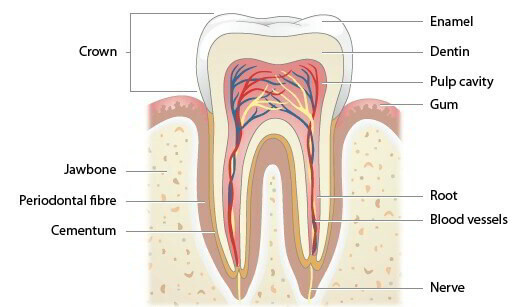 The hard outer layers of a tooth surround the pulp inside. The gums form a tight seal around the teeth. The health of the teeth is at least 50 percent dependent on the health of the gums; in the western world, more teeth are lost through gum disease than through tooth decay Brushing the teeth regularly and frequently (at least twice a day) is the best possible way to maintain and protect the health of the teeth and gums. Most dentists would agree that the single most important thing is to use a method that is suitable for you and that is efficient. At one time, a rolling action was propagated, with a downwards motion for the upper teeth and an upwards motion for the lower teeth. This, however, was shown to be only about 50 percent as effective as the technique that is now generally recommended – a gentle, rapid, short, to-and-fro action in the horizontal plane using the side and edge of the brush. Don’t press too hard or see-saw the toothbrush backwards and forwards – this may damage the delicate gum margin. If you cannot brush between meals, chewing sugar-free gum may help. Avoid sugary foods and drinks. If your water does not contain fluoride, ask your dentist about using fluoride tablets or drops. Wind a 10-15cm (4-6in) length of floss around the first two fingers of each hand. Slide it gently down between two teeth, pressing it against the side of the tooth (but do not see-saw it against the gum). Then swing it upwards, pressing against the side of the other tooth and removing any debris with it. Your hygienist will descale the teeth and remove any deposits of calculus from the gum margins. Visits should preferably be at six- monthly intervals. Children, whose teeth and bones are still forming, need to have an adequate intake of calcium and vitamin D in their diets. While it is a myth that your teeth suffer during pregnancy, your gums certainly do – one of the effects of the high level of circulating oestrogen and progesterone that occurs during pregnancy is softening of the gum margins. For this reason alone, you should visit your dentist two or three times during pregnancy to make Sure all is well. There is unequivocal evidence to show the sort of diet we eat affects the health of our gums and teeth, and that dental decay is caused in the main by sweet, sugary foods containing sucrose. Such foods include most refined foods and sweet drinks, sweets, chocolate and ice cream. If you want to have healthy teeth do not have sweet, sugar)7 foods or drinks between meals – within 20 minutes of taking such foods, damage to your gums and teeth has already begun. Dentists agree that “safe snacks” would include any fresh, raw fruits and vegetables, potato crisps, nuts or cheese. Cheese is a particularly useful and healthy food for the mouth, gums and teeth, as it stimulates the production of saliva and it is a very good way to end a meal. Saliva helps prevent the production of plaque acid, which is caused by bacterial fermentation of sugar in the diet (the initial process that starts off tooth decay). There is clear evidence that fluoride, in all its forms, protects the teeth against decay and it is most effective if the fluoride is actually incorporated in the teeth during their development. By far the best way of taking fluoride, of course, is in drinking water. Also make sure that you always use fluoride toothpaste and consult your dentist about giving fluoride tablets or drops to your children to protect their developing teeth. The arch villain of tooth decay is plaque acid, which corrodes the outer protective enamel of the teeth and eventually works its way through to the inner living part of the tooth, the pulp cavity (causing pulpitis). Smoking upsets the natural bacterial flora of the mouth; it causes unpleasant mouth odour and stains the teeth, mouth, and even the skin surrounding the lips, an unpleasant yellowish colour. It also increases the risk of gum disease and mouth cancer. Certain drugs can affect the health of the gums and teeth. Anti-epileptic drugs, such as hydantoins, can make the gum margins red, soft and swollen. Some drugs used to treat heart conditions can also cause the gums to swell. Tetracyclines, if taken by a pregnant mother, may be deposited in her baby’s developing teeth and may stain the teeth a yellowish colour.